You'll be £19.99 closer to your next £10.00 credit when you purchase Jocks in the Jungle. What's this? Order within the next 40 minutes to get your order processed the next working day! In 1943, there was no thought of good times for two battalions of Scottish soldiers. For them, India meant a new and unimaginably arduous kind of training. Some of the Black Watch boys had seen action in Somaliland, Crete and Tobruk. Some of the Cameronians had fought the Japs in the Burma retreat. Even for these, such training was trial by ordeal. Many more of the Jocks were new, just shipped out from Scotland, but all of them were ordinary men, men from the towns and villages who'd taken the King's shilling in their country's peril. These were first-class British infantry, but not the super-selected special forces types that we know today. Nevertheless, it was a special-forces job they were supposed to do and that is what they were called, Special Force. The challenge in Madhya Pradesh was to turn themselves into jungle fighters as good as the Japanese. They had a few short months to become Chindits. The two brigades they joined numbered 7,677 officers and men going into the jungle, of whom 531 were killed, captured or missing, and around 1,600 were wounded. By the end, some 3,800 were too sick to fight. Only 1,754 could be classified as 'effective' when they came out and, in truth, half of those were fit for no more than a hospital bed. It was a miracle anybody survived at all. And that was just two of the five brigades that went in. Was this the greatest medical disaster of World War Two? Who caused it? This new book has the answers. The author who may well be better known for such bestselling titles as Men and Sheds has a personal connection in these events in Burma, his father, Private/ Rifleman Andrew Douglas Thorburn, sometime Lance Corporal, who was there never said a word about it. Indeed he was eleven stone when he joined the army, barely half that when he came out of the jungle having suffered amoebic dysentery. Of two brigades numbering 7,677 offers and men who went into the jungle by the end some 3,800 were too sick to fight of 1,754 who returned classified as effective half were only fit for a hospital bed. The Chindits achieved near miracles but at a terrible cost, as the book concludes there were ‘unwitting volunteers in a gigantic, disorganised, unintentional medical experiment’. While ensuring, as this book does, that their sacrifice is not forgotten we must not overlook the fact that our knowledge now of jungle warfare and the health risks it entails is now far advanced to that of seventy years ago. I have to say this is a really excellent book. It recounts the tragedy of the Chindits, and I say tragedy deliberately because it was one, from both the vista of the top table and from the jungle floor. The untimely death of Orde Wingate will always be essential to the story and any account of this most singular of men is told with power and economy. The book is tinged with the bitterness the author must feel that his father, who never talked about it, had to suffer such privations, partly because of the angry game of pass the parcel going on between the Chindit leadership and the Anglophobe Vinegar Joe Stilwell and Lord Mountbatten – commander of SEAC, South East Asia Command to most of us, but Save England’s Asian Colonies to quite a lot of Americans. Bill Slim is in there somewhere and I find it hard to be harsh towards him at all, but you can’t help wondering what would have happened had Wingate, this weirdo one off, hadn’t flown into a mountain. Stand on the Thames Embankment up by the MoD building and you cannot fail to miss the wonderful Battle of Britain Monument. It is a stunning piece of modern sculpture and you can look at it for ages, finding new bits you hadn’t noticed before and always enjoying new elements as the light changes. It tells a story and it is multi-faceted, just like the Battle. This is just what the artist, Paul Day, intended. It encapsulates the importance of the Battle in British history. Turn round and walk across the road and there in the gardens of the MoD stands the altogether modest memorial to the Chindits, a sculpture, as you would expect; of a chinthe, the lion-like creature which Wingate chose as the name for his Special Force. Somehow, it became corrupted as Chindit, and although their battles against man and elements will never have the significance of the Battle of Britain, just for a short time, these amazing men were taking the war to the Japanese in the most inhospitable place on Earth and proving they could win. Their monument should be bigger. In its own way, Gordon Thorburn’s book is a memorial to his dad and all the others who were in that horrible place and should be read by everyone. 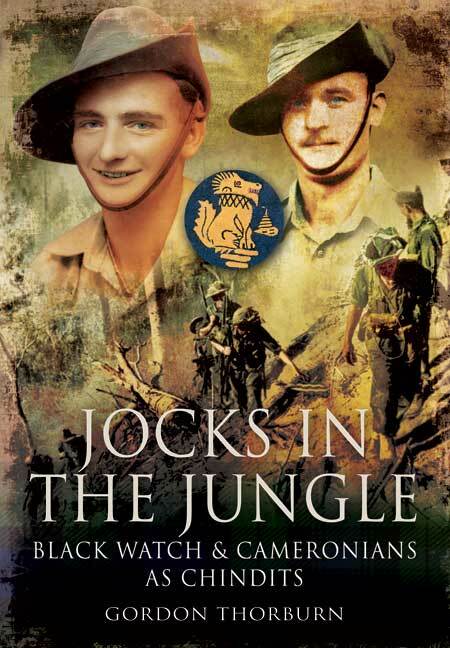 Jocks in the Jungle follows the experiences of the 1st Cameronians and 2nd Black Watch from the time of their arrival in the Far East to their becoming Chindits, and the expeditions which this celebrated brotherhood launched deep behind the Japanese lines into occupied Burma. Using various reports, veterans accounts and extracts from the battalion war diaries, Gordon Thorburn explores the driving forces behind the creation of the Chindits, detailing their hurried period of training before the first operations. He also dwells extensively on an issue which has frequently been overlooked in previous discussion, that of the human cost and the immense difficulties in administering proper medical care on such expeditions. The casualties suffered from actual combat were nothing out of the ordinary, especially considering the nature of their role and the precarious supply lines, but by far and away the largest drain on manpower was sickness, sometimes rendering as much of 50% of the force committed as unfit for service. A well researched book, casting fresh light on a famous episode of the Second World War.